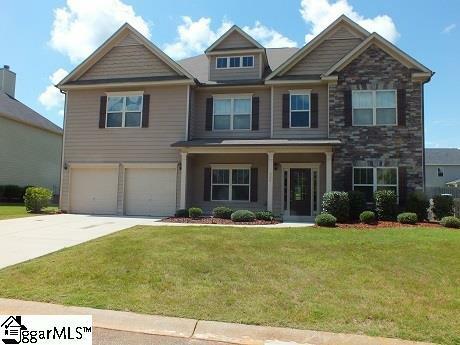 IMPRESSIVE 6 BEDROOM, 4 FULL BATHROOM HOME IN BOILING SPRINGS WITH MANY UPGRADES THROUGHOUT THIS AMAZING HOME, THAT IS IN DESIRED STERLING ESTATES. THIS HOME HAS OVER 4,000 SQUARE FEET OF LIVING SPACE. THE EXTERIOR OF THIS HOME IS HARDIEPLANK AND STACKED STONE. AS SOON AS YOU WALK INTO THIS EXCEPTIONAL HOME YOU WILL BE WOWED BY THE 20 FOOT 2 STORY FOYER AREA. TO YOUR LEFT IS A LIVING ROOM AREA THAT HAS AN AMAZING COFFERED CEILING AND HAND SCRAPED HARDWOOD PLANKS WITH SHADOW BOXES BELOW THE CHAIR RAIL MOLDING THAT IS CARRIED THROUGH MOST OF THE MAIN LEVEL AS WELL. TO THE LEFT OF THE FOYER IS THE FORMAL DINING AREA THAT HAS A TREY CEILING AS WELL AS 3/4 WALL SHADOW BOXES. AS YOU WALK INTO THE MASSIVE GREAT ROOM YOU NOTICE THE ROUNDED CORNERS AND ARCHWAY THAT ADDS SO MUCH CHARACTER. THE GREAT ROOM ALSO HAS A FIREPLACE AND HAND SCRAPED HARDWOOD PLANKS AS WELL AS THE DOUBLE CROWNED MOLDING THAT IS CARRIED THROUGHOUT MOST OF THE MAIN LEVEL. AS YOU WALK INTO THE WIDE OPEN KITCHEN AREA YOU ARE GREETED BY MORE OF THE SHADOW BOXES BELOW THE CHAIR RAIL MOLDING AND MORE DOUBLE CROWNED MOLDING. 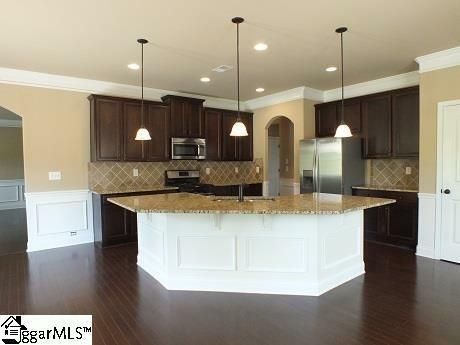 THERE IS A LARGE ISLAND WITH A BEAUTIFUL GRANITE COUNTER TOP. THE GRANITE IS CARRIED THROUGHOUT THE REST OF THE COUNTER TOPS AS WELL. THERE IS PLENTY OF STORAGE IN THE BEAUTIFUL WOOD CABINETS. ALSO THERE IS A DESIGNER CERAMIC TILE BACKSPLASH. 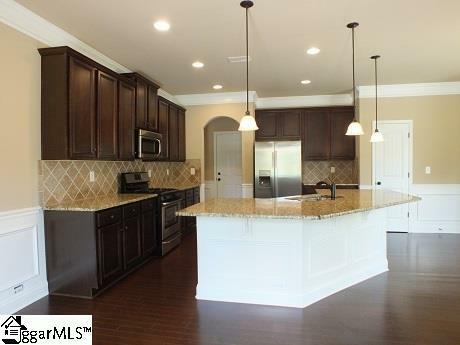 THE KITCHEN COMES COMPLETE WITH NEW STAINLESS STEEL APPLIANCES INCLUDING A GAS RANGE AND REFRIGERATOR. THERE IS A BREAKFAST AREA COMPLETE WITH BAY WINDOWS AND A SITTING AREA WITH A GAS FIREPLACE. THERE IS ALSO A WALK IN PANTRY. THE MAIN LEVEL HAS A LARGE BEDROOM WITH A WALK IN CLOSET THAT WOULD MAKE A GREAT IN-LAW SUITE. THERE IS A FULL BATHROOM RIGHT ACROSS THE HALL. AS YOU WALK UP THE OAK STAIRS TO THE 2ND FLOOR TO YOUR LEFT IS ONE OF 4 BEDROOMS ALL WITH WALK IN CLOSETS AND NEW UPGRADED CEILING FANS. ALSO UPSTAIRS THERE ARE 2 FULL BATHROOMS WITH THE TUB/SHOWER COMBINATION NEW FIXTURES AND DESIGNER MIRRORS THAT CARRY THE OIL RUBBED BRONZE THEME IN EACH. IN THE MIDDLE OF THE BEDROOMS AND BATHROOMS MENTIONED IS THE AMAZING MASTER BEDROOM AND ON-SUITE AREA. THE MASTER BEDROOM HAS A TREY CEILING AS WELL AS A NICE SITTING AREA. THE HAND SCRAPED HARDWOOD PLANKS ARE CARRIED THROUGHOUT THE 2ND FLOOR. THE MASTER ON-SUITE HAS A DOUBLE SINK VANITY WITH DESIGNER MIRRORS. THERE IS A GARDEN TUB AND A SEPARATE SHOWER WITH GLASS DOORS. AND YOU WILL BE IMPRESSED WITH THE 18 X 8 WALK IN CLOSET. ON THE 2ND FLOOR THERE IS ALSO A MEDIA/ENTERTAINMENT ROOM THAT IS 18 X 16 COMPLETE WITH A MINI KITCHEN WITH AN UNDER THE COUNTER MICROWAVE AND A MINI REFRIGERATOR. 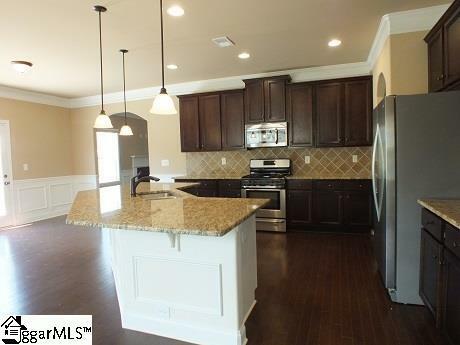 THERE ARE WOOD CABINETS AND MORE BEAUTIFUL GRANITE COUNTER TOPS. ALL OF THE FIXTURES IN THIS HOME HAVE BEEN REPLACED AND UPGRADED. THERE IS EVEN A BALCONY AREA OVER LOOKING THE FOYER AND FRONT DOOR AREA ON THE 2ND FLOOR. IN THE BACK YARD THERE IS A LARGE PATIO AREA AND PLENTY OF ROOM FOR YOUR OUTDOOR FURNITURE AND YOUR GRILL FOR YOUR FAMILY COOKOUTS. THIS HOME IS A MUST SEE AND THE SELLER IS VERY MOTIVATED AS WELL. Listing provided courtesy of Scott Lyons of .